Exciting news for the 2017-2018 season! Our club has a new snowmobile and 4ft trail groomer. This was bought thanks to a generous donation from the two local Thompson Nicola Regional Directors (Herb Graham and Randy Murray). For more about this click here for our December Trail Report. For a low-resolution pdf copy of our Kane Valley brochure click here: Nicola Nordic Ski Club 2012 brochure (2.3 MB). High quality printed copies are available at all Kane Valley trailheads. The Nicola Nordic Ski Club is based in Merritt, BC. 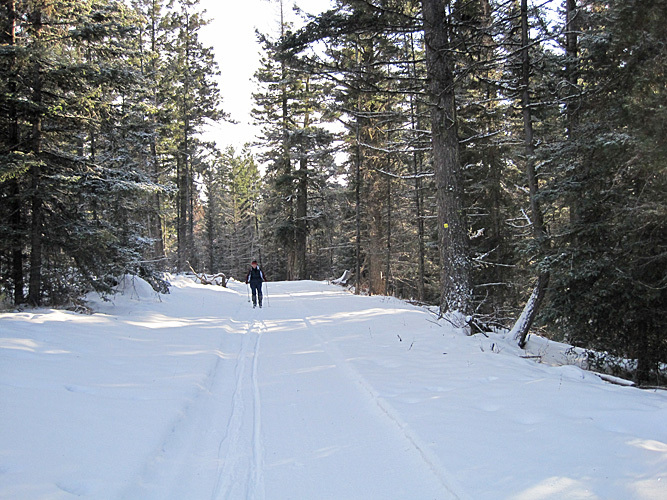 We maintain the Kane Valley Ski Trails, situated in the beautiful Kane Valley, just 18 km from Merritt. Here you can choose from over 50 km of groomed trails, offering a variety of terrain and skill levels, but all ideal for wilderness Nordic skiing. Our trails are not suitable for skate-skiing. All our trails are marked with maps and trail indicators and there are several shelters where you can stop for a break. Go to our Kane Valley Trails page to get more information, download a copy of the trail map or get directions on how to get there. There is also information on local accommodation. Copies of the trail map are available at the trailheads in the Kane Valley. Please note: the Kane Valley Ski Trails are not patrolled; use at your own risk. The Kane Valley cross-country ski trails were established by local volunteers working with the BC Forest Service many years ago, but for over 15 years these trails have been maintained solely by our club. The club is run entirely by volunteers. Membership and trail fees go towards grooming (our major cost) and the maintenance of the trails and shelters in the summer. Our trails are open to members (membership fees under review for 2017-18) or with a daily ski pass (fee under review). Go to our Membership page to download a membership form. A reminder – dogs are only allowed on Matthew’s Loop and the access trails leading to this loop. Go to our Events & Programs page for information on upcoming events, including our popular Chili Sunday. Check out our Photo Gallery page to see more photos of the Kane Valley ski trails and other places that our members ski. Visit our Blog & Trail Conditions page to report (or read about) recent snow conditions, downed trees or any other points of interest. Regularly posted snow and track conditions help others decide when and where to ski and help the club keep track of trail grooming needs and safety concerns.